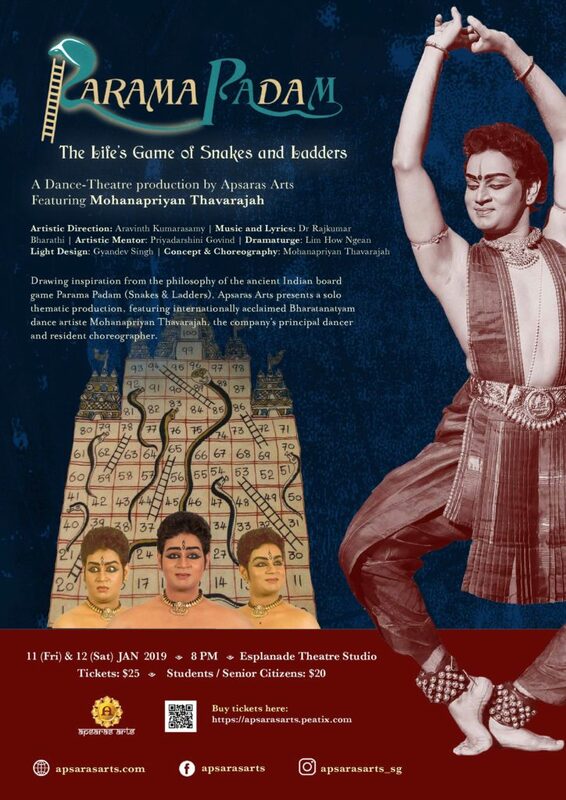 Drawing inspiration from the philosophy of the ancient Indian Board Game - Parama Padam (Snakes & Ladders), Apsaras Arts presents a solo thematic production, featuring internationally acclaimed Bharatanatyam dance artiste Mohanapriyan Thavarajah, the company’s principal dancer and resident choreographer. Parama Padam was created by the followers of the Vaishnavite faith, with the duo purpose of entertainment and teaching moral values of human life. On the game board, there are hundred squares which are illustrated with Snakes and Ladders. The ladders in the game represent good virtues and the snakes indicate vices. Ladders take you up as the good deeds take us to heaven, while the snakes bring you down as to a cycle of re-births. The final goal is to reach Vaikuntha or heaven. During the 18th century, the British made this game popular world-wide and called it “Snakes and Ladders”. Apsaras Arts Dance Company is well known for its iconic block buster dance productions such as “ANGKOR - An Untold Story” (2013), "ANJASA - The Wonders of Buddhist Monuments of Asia", “ALAPADMA - The Lotus Unfolds”(2015), “AGATHI - The Plight of the Refugee” (2016) “ANJANEYAM - Hanuman’s Ramayana” (2017) etc. Mohanapriyan has been acclaimed for his innovative choreography and captivating performances for these productions which were premiered at the Esplanade Theatres on the Bay and have toured internationally.